Print your favorite picture on a custom iPad Pro 12.9 (2018) case! In just a few steps, you can create a custom silicone case as if you were a real designer! Take your tablet with you everywhere you go with an iPad Pro 12.9 (2018) custom case in Silicone. At GoCustomized, we know the importance of protecting your device in every situation. Thereupon, we offer you the possibility to create your own custom iPad Pro 12.9 (2018) case very quickly and easily, thanks to our easy-to-use customizer. 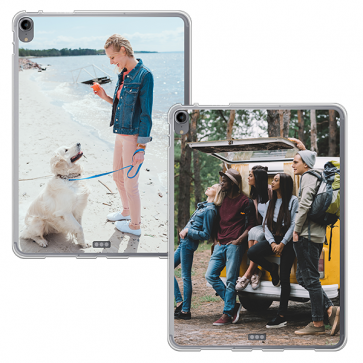 The personalized silicone case is manufactured with an efficient shock absorbent material, covering your tablet on the back and the side, protecting it from every bumps and scratch. The design will be printed on the custom silicone case with a high-quality, scratch resistant ink, using a UV printing technique. This way, your custom iPad Pro 12.9 (2018) is provided with the best protection possible and a tailor-made customization. Making your own custom iPad Pro 12.9 (2018) case is very quick and easy to do with our user-friendly customizer! Start by uploading your favorite picture. You can upload pictures from your computer or your phone, connect to your Facebook or Instagram account to choose a photo or even use one of our designs available in our collection. Then, if you feel like making a collage or having a particular template, change the layout of your print with a grid or one of our premade template. Lastly, you can add to your case some text, some stickers and a filter. There is no limit to your imagination! 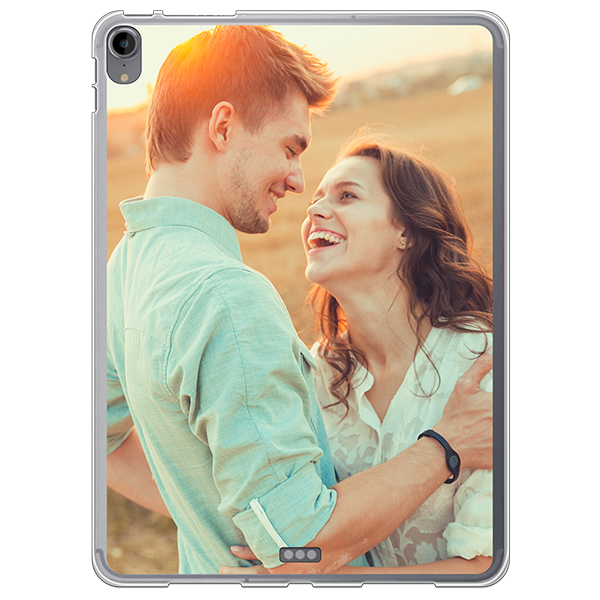 The design will be printed on the back of your custom iPad Pro 12.9 (2018) case, exactly as you designed it! Once you are done with the design of your custom iPad Pro 12.9 (2018) case, you can proceed to the checkout. Fill up your information and make sure to put the right information. After that, choose your shipping method and your payment method. You are then ready to place your order. Once we receive it, our production team will start almost immediately to produce your case and will ship it within 24 hours. You will then receive your case within a few business days, depending on the shipping method you have chosen. If you have any question, feel free to contact us via the support. We will be happy to answer all of your questions.